In the middle of Southern California’s first heat-wave I was anxious for good news. Like when was the mercury going to trend in the other direction or when would the first dousing of rain arrive. But sometimes good news comes in the form of light packages delivered to your front door. Reaching across the threshold of my doorstep into the hot, heavy air, the box FedEx had just dropped off felt wispy. A mere pound at best. I knew what was inside: a pair of KEEN Clearwater CNX sandals. But the box was light. Surprisingly light. Had KEEN mailed me an empty container on accident? Closing the door, I left the oppressive heat behind and ripped into the carton. It wasn’t empty; inside were the size 7.5 sandals in a cranberry-esque shade of pink. I held one in each hand and examined every detail. Folding them in half I noted their flexibility; tugging at the bungee lace I noted their promise of a custom fit; and tossing them in the air I noted their unbearable lightness. While the traditional KEEN sandal styling was recognizable – KEEN’s patented toe protection, a webbed upper, an open heel, and a bungee cord lace – the weight was not. These were feather-light. So light in fact I grabbed my first generation KEEN sandals – my trusty Newports – and performed a high-tech, side-by-side comparison: I held a Newport in my left hand and a Clearwater CNX in my right. I tossed and caught the shoes like I when I learned to juggle. The Newports, at almost a pound, were considerably heavier. According to KEEN’s product specs the new Clearwater CNX’s were a slight 7.6 ounces. Whatever, they felt wispy in my hand. Now I was just anxious to move into the long Fourth of July holiday weekend and put these sandals to the test. First up: a trip to the grocery store. I needed to stock up and I wanted to show these shoes off. They paired nicely with shorts and a t-shirt and I felt mountain-town cool. As a seasoned KEEN footwear owner (there are thirteen pairs of KEEN shoes in my home), I had ordered one size larger than my usual shoe size despite KEEN’s fit tip finding that the Clearwater CNX sandal ran true to size. My feet are wide and my Newports chafe my pinky toe, plus newer KEEN’s tend to run narrower than my capacious feet. I’d employed this successful strategy – sizing up – when I’d purchased my KEEN Commuter bike sandals. It worked. The CNX’s felt snug but did not irritate my small toe into an angry red mass. The texture of the polyester webbed uppers felt soft against my skin yet durable. Like they wouldn’t give the first time I moved aggressively in a direction other than forward or backward, particularly as I dodged the haphazard maneuvers of frenzied pre-holiday shoppers. The soles and tread also felt tough. KEEN notes their low-profile CNX’s boost the “natural flexibility of the foot” and improve “ground contact.” They even promise the shoe “provides advanced traction on slick surfaces.” This was good to know because I had plans for this shoe. But for now, as a lifestyle sandal, the Clearwater CNX received high marks, meaning they looked good, were super comfortable, didn’t overheat my feet, and provided protection from wayward shopping carts piloted by children. Next was a trip into the woods to walk my energetic golden retriever. We opted to trek his favorite trail called ‘Don’t Shoot Me.’ It’s rugged, starts and finishes at a shooting range (which requires a bit of speed until you clear the perimeter), and ascends as much as it descends. The contoured sole of the Clearwater CNX delivered enough arch support for the three-mile, round-trip hike while the low-profile sole supplied considerable traction on the slick DG (decomposed granite). KEEN’s notable full-toe and foot protection also came in handy as I climbed over downed trees, scrambled through boulder gardens and squeezed between overgrown sage bushes I was sure concealed rattlesnakes. Again, I was impressed with the Clearwater CNX sandals. To escape the heat, I took to the water and brought the Clearwater CNX’s along. 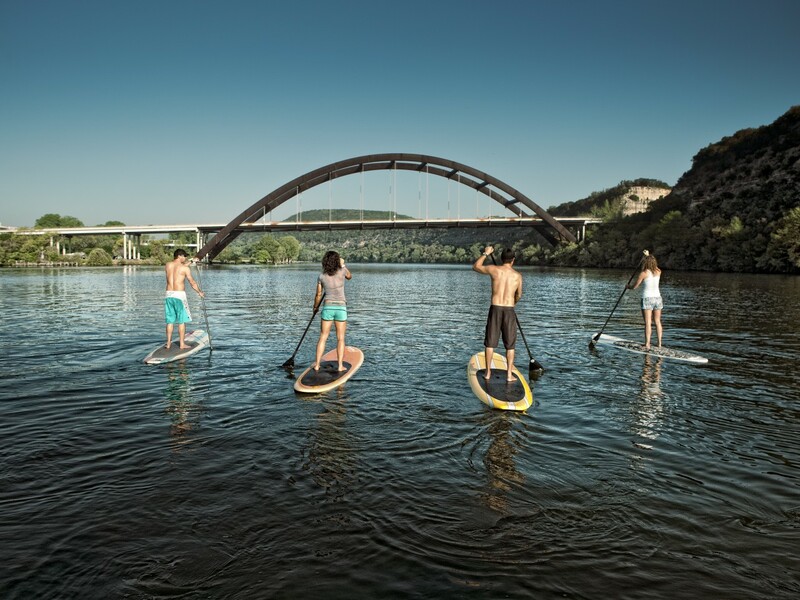 I decided to standup paddleboard wearing the sandals. While I usually SUP sans shoes, I was in the mood for distance. On a paddleboard distance equals time on my feet which is always made better with a bit of foot support. But would the Clearwater CNX sandals be too bulky? Would I hate the confinement? Would I be too hot? Would I lose connection with board? These were all questions I had so I donned the Clearwater CNX’s, pulled the bungee cord tight, and stepped aboard. I SUP-ped a little over 12k and the Clearwater CNX’s minimalist sole held their own: supporting my arches while accepting the stresses of aggressive reaches and quick changes in stance that resembled balancing drills. The following day I showed up at the shoreline again, this time with my 17-foot touring kayak. Sliding into the cockpit I positioned the foot pegs and was pleased to use KEEN’s new lace-capture feature, a plastic clasp to tuck the 2mm bungee away. I paddled 15k noting that kayak footwear is about performance. I’d pushed hard against the foot pegs as I edged around buoys and even dumped over to see how the sandals fared as I re-inserted myself into the boat. The Clearwater CNX’s did well: they protected my feet and allowed me to maintain the necessary connection points between my toes and heels and the bottom and sides of the boat. Most of all the tight-fitting sandal and lace-capture system assured me there was no danger of snagging a shoe. Another note: I’d carried both of my paddle-crafts to and from the car wearing the Clearwater CNX sandals and they handled the muck of the shore well and eased my worries that I would stub my toe and trip due to my limited peripheral. Only a few annoying pebbles made their way between my toes but they were easily dispensed with a quick flip of the sandals off and back on again. Another consideration: color. While I was initially hesitant about the Barberry/Hot Coral sandal’s KEEN sent me, after five-days of testing I highly recommend stepping outside your color box. KEEN made its new line of CNX shoes colorful and you should reap the benefits of their exuberance. The Clearwater CNX comes in a cheery Norse Blue with a Super Lemon sole, a girly Ultra Violet accented with Whisper White, a summery Greenbriar green highlighted with an even more spring-like green. But if you’d rather sport riotous color well above your ankles, KEEN makes the Clearwater CNX in a refined black with yellow sole and a Gargoyle Grey nuanced by Norse Blue. But my favorite feature of these new KEEN Clearwater CNX’s: they’re washable. Filthy from a busy weekend of non-stop use, their pink color was mere hue of its former self. I tossed the sandals into the washer with a small amount of detergent and in 20 minutes the brilliance of the Barberry tone returned and they were ready for a night at the pub. Shoe Construction: 4mm mid-sole drop with a non-marking rubber outsole, patented toe protection, and Aegis Microbe Shield lining to control odor-causing bacteria. To purchase the KEEN Clearwater CNX sandals, click here (for women) and click here (for men). 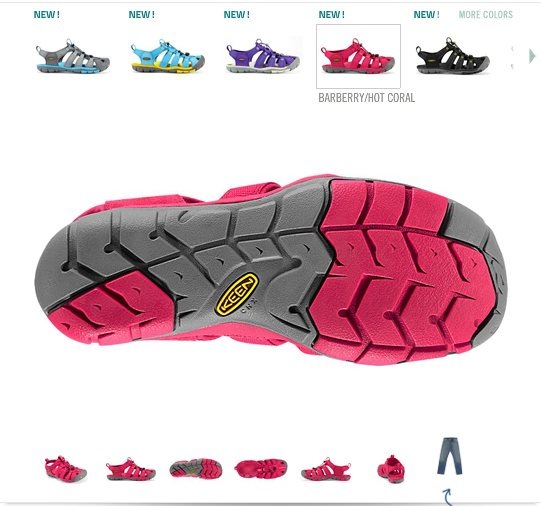 For more information on KEEN Footwear, www.keenfootwear.com. This entry was posted in Footwear, Gear Reviews by Cathleen Calkins. Bookmark the permalink. Let’s talk weight. A men’s size 11.5 Clearwater CNX weighs 10.75 oz each. Given that the keen Newport, same size weighs 17 oz, that’s quite an improvement with excellent support and protection. One can chase weight to the end of the world and the lightest flip flop out there and only shave a few ounces off. And end up with a slipper offering little use. For twice the weight, I’ll take the CNX and have shoe-like protection. For backpacking, sometimes you’re better off with the heavier option because it’s so much better. The lightest tent isn’t really your best choice if it fails at 2am in the rain.